Ed Halm found himself fighting to maneuver his kayak through the swampy undergrowth in the backwaters of the Econlockhatchee River in Central Florida. As a retired Navy officer and survival instructor, he realized the problem he was having was due to the design of his paddle: fine for slicing through open water, but for gnarly conditions, he wanted something with a bit more grip—something with the teeth to negotiate the hazards of shallow water. Ed went to bed that evening thinking about paddle design. At 3:00 in the morning he got up, started drawing, and by sunrise he had a soon-to-be-patented hook-and-tooth design that launched Backwater Paddles. He originally set out to produce a line of full-size paddles, but quickly realized that prohibitive tooling costs made it impossible for him to finance the operation on his own. So he put together a group of investors, only to be stopped cold by the recession of 2008. Backwater Paddles seemed to have run aground. Then he saw a story in an outdoor magazine about a guy who used ping-pong paddles to steer his kayak with one hand while fishing with the other. And it came to Ed that he could adapt his design to make a line of hand paddles, which because of their smaller size, would be much less expensive to manufacture. In fact, he could have a buddy make them in his woodshop. Soon he was cranking out Predator and Piranha hand paddles, and acquiring a cult following in the backwater paddling world. Ed decided to make a version of his most popular hand paddle, the Piranha, in plastic, which would allow him to pump up the color and graphics, as well as enhance its performance. He turned to Mark Best at VectorCAD for help in producing a prototype. Working from the existing Piranha paddle, Mark developed the Piranha X design in SolidWorks, making it a little wider and longer than the original, with finished dimensions of about 22 inches long and 5 ¾ inches wide. This was too big for standard rapid prototyping methods. Besides, Mark wanted to be able to show it to Ed in the actual plastic that the product would be made in—Delrin® acetal resin. So he decided to have the proof-of-concept prototype machined by Proto Labs’ Firstcut service. “Once the design was approved, Ed was in a hurry to have something real to look at and I knew Proto Labs would turn it around fast. And I was confident that the Firstcut process could deliver on the fine, grooved detailing on the handle,” Mark said. Days after Mark uploaded his 3D CAD file to Firstcut, Ed was holding the first Piranha X hand paddle in his hands. Delighted with the result, Ed sent the prototype paddle around the country on the trade show circuit to get feedback from customers. Because it looks, feels, and functions exactly like the real thing, people can get a completely accurate feel for the product. Based on their responses, Ed plans to make small adjustments in the design before going into production. 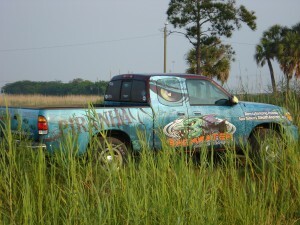 This entry was posted in Backwater Paddle Products, Marketing My Company on May 11, 2011 by Paddleman. Looking AWESOME!! 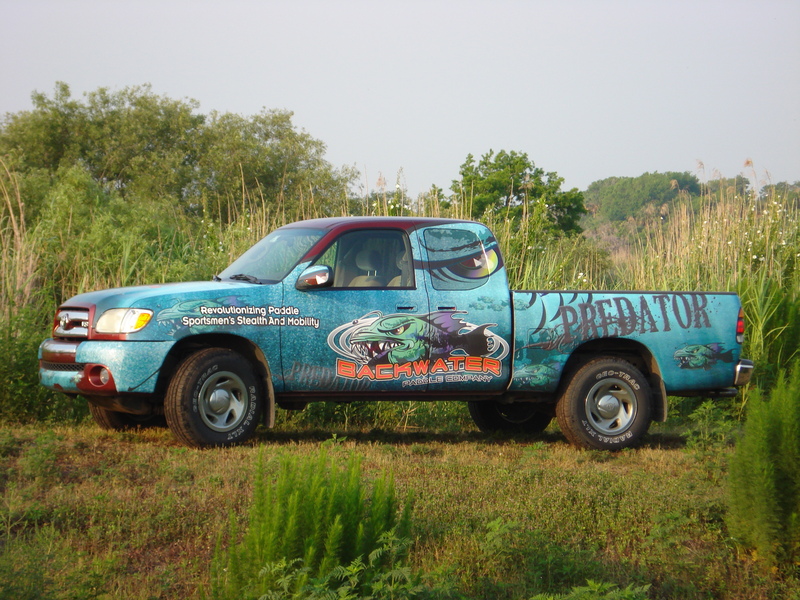 Just recently had the Backwater Paddle Company Truck wrapped. 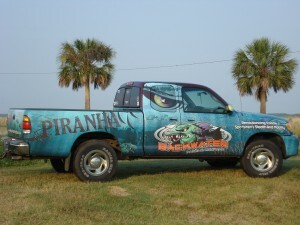 Terry Griffith from Colossal Signs of Cocoa Beach, Florida designed and attached the wrap over a couple of day period. I have been so busy, that I finally just got some time to head down to the St Johns River and take some pics. The early morning sun and the St Johns River watershed provided the lighting and backdrop. If you haven’t noticed…the two sides are wrapped differently. The passenger side is the Piranha and the drivers side the Predator model. I can’t believe all the attention the Backwater Paddle Truck wrap draws. As a matter of fact, I have to get used to everyone staring at me while driving down the road! No I have to consciously drive the truck in “normal” (foot out of the throttle) mode because all the attention it draws!! 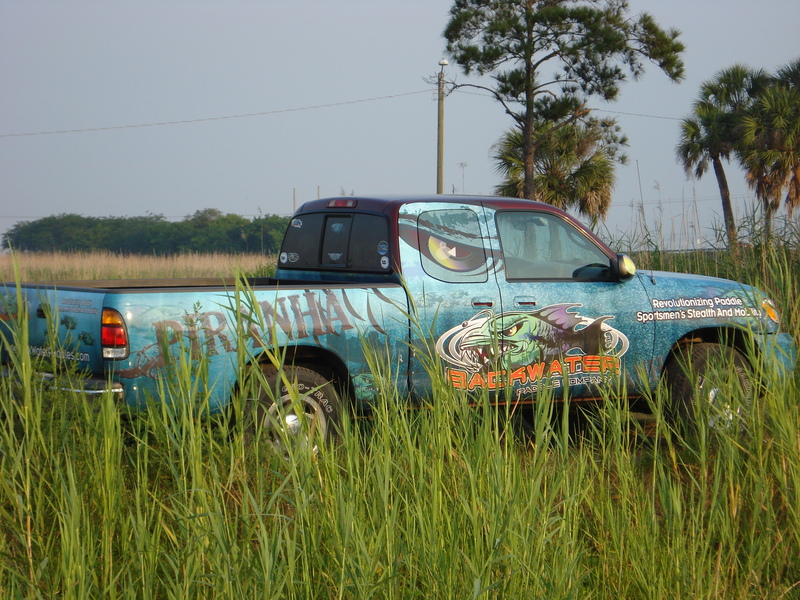 The Backwater Paddle Company Truck is making the rounds throughout the southeast tournament trails. Hope to see you one day. Paddle on my friends!! This entry was posted in Uncategorized on May 10, 2011 by Paddleman.